Waking up with the sound of musical instruments, I realized that someone has already started Morning Practice with the singing activity. Just as I walked to the group, others were showing up. It was as if almost everyone noticed the sound at same time as me and did the same as me. We sang the “Country Road, Take Me Home,” and few other songs. I love singing, but I barely sang in the morning. It felt really good. I felt really good that I could tell I’m energized and starting Day 2. Day 2 started with the META harvesting followed by check-in. The non-verbal harvesting was interesting, but I felt a bit funny. To be honest, I didn’t (well, I still quite don’t) understand the core meaning of harvesting, and maybe that’s why I felt funny about it. Then, we got into the World Views. 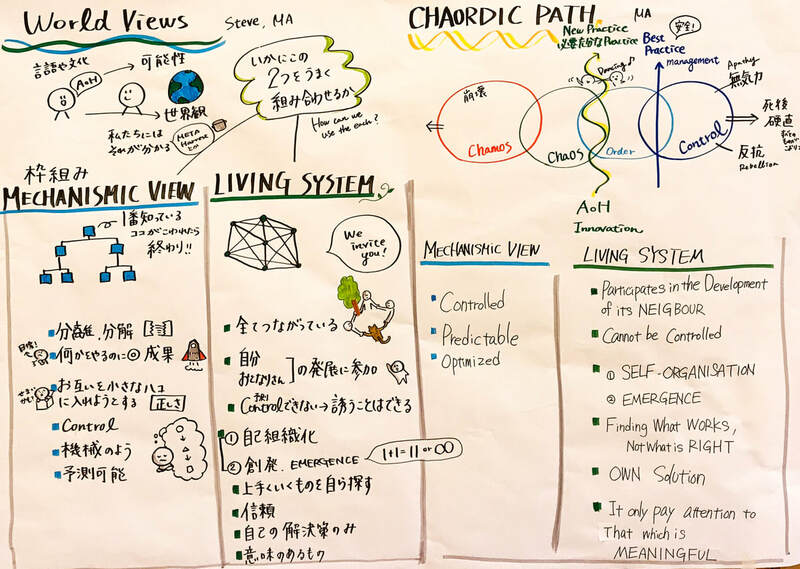 Two different views were introduced; mechanistic and living systems. The mechanistic view is controlled and systematic, and the living system is interconnected and self-organizing. I found these views in our daily lives. 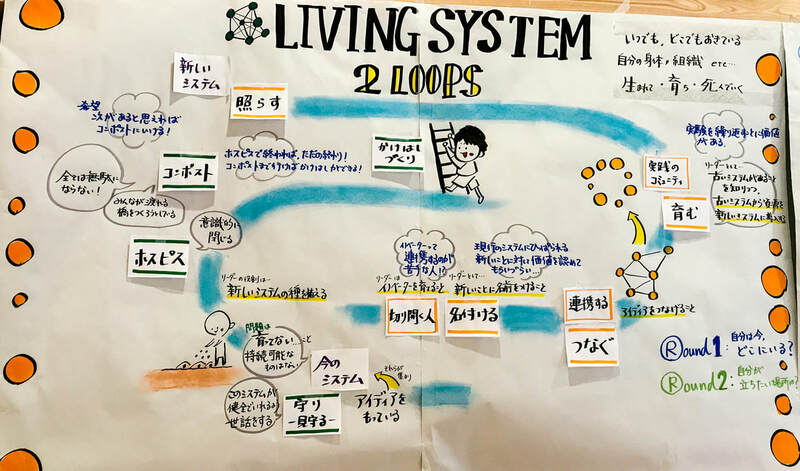 The mechanistic can be seen in our work situation while the living systems can be seen in our private situation. Like Steve said, they can be coexisting, and I thought it’s funny that examples are seen right in front of our eyes. After the session, we had the Chaordic Path. It’s supposedly a path between chaos and order that can bring innovation. At first, I wasn’t really able to understand it. I thought in what kind of situation that is either chaos nor order yet powerful enough to create new innovations. It is a concept that I feel I got it, yet, at the same time, I also feel I don’t fully understand it. Then, we had Appreciative Inquiry. We’re spread into groups of three and talked about ourselves answering a question already given. One is a storyteller, while the others are harvester and witness. I see the difference while I was listening to my group-mates. One is that when a specific role was given, it is easier to understand what the storyteller was trying to say. Recognizing this would help me not only to understand the story but also to be able to hear and see the story further details. When we finished the AI, it was the lunch break. We had Somen Nagashi, or noodle slinger. It was certainly one of favorite moments of the day! Nothing can be better when eating and having fun came together and mixed! 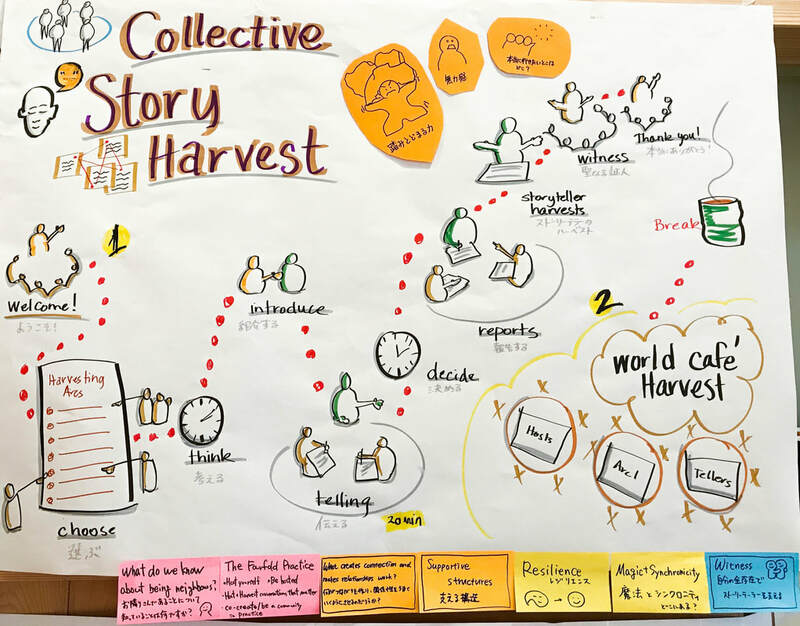 After the lunch, it was the time to do the Collective Story Harvesting. It is one of the most intriguing session I’ve had. Not only to listening to the storyteller’s story but also I was listening to the story through the “lens” that were given. Of course, it might be foreseen, but seeing the story through different perspectives would help us understand the teller and surrounding stories and ideas. The Day 2 was concluded with the check-out and, again, delicious dinner! Continue to the Day 3. ​Part 2 (Harvest) : Question "What made deep connections?"